The business world has always been a battleground where companies engage in an endless game among each other for grabbing that number one position in every sector. Every firm enters in this maze with one paramount goal- to enhance the sales and profit, and occupy maximum market share. What matters the most in the survival of an enterprise is the quality and relevance of the product or service that enterprise delivers in the market. However, it is not all about just giving the best. You have to position your goods and services in such a way that the potential buyers and consumers will get to know about it, find it worth buying and find it relevant for them. The arts or rather science of marketing combines the myriads of strategies and techniques to enhance the sales of your goods and services. Here the customers are the ultimate destination points. With the goal of customer service in mind, companies have to analyze and improve customer interactions and data. In that aspect, customer relationship, management-CRM is a very crucial criterion. One of the important facets of CRM is relationship marketing with an eye on the long term marketing and customer loyalty services. Relationship marketing focuses on long term customers by placing the focus on loyalty, providing them with exemplary services and products. The relationship marketing stands out from the traditional transactional style which focuses more on individual sales. 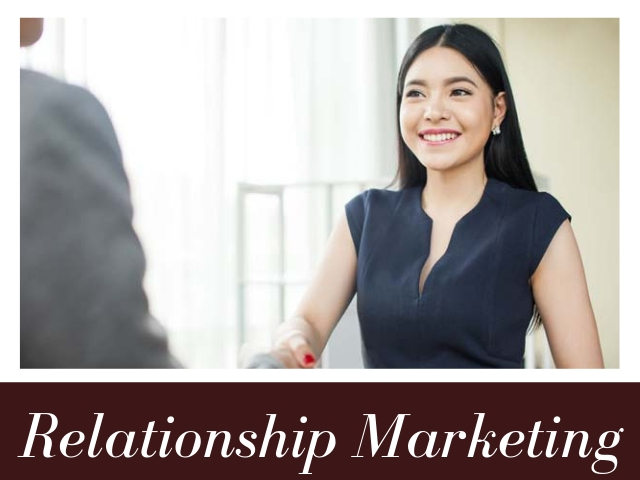 The essence of relationship marketing is a brand-oriented personal or emotional connection. Marketers are mining the insights to identify the consumer’s culture and trend. The very idea of CRM works based on the understanding of creating a new customer is much more difficult than maintaining your existing customer base. Not just that- a delighted customer is the most effective catalyst of your business as he or she promotes the sales and customer base itself quite naturally than any conspicuous means adopted by a company to promote the sales. Relationship marketing mainly works on the improvement of internal services. Unsatisfied customers are created not only due to poor product quality but also due to the failures in customer care activities. Therefore it is important that a robust sales database be kept in every business, which records the customer profile, buying patterns and history of contacts. Proactive communication is key. Hence dedicated customer relationship management personnel in business firms are empowered to contact the customers, know their needs and maintain a hearty relationship. Recently many organizations across the world are facing the changes in time and economies urging the changes in the business itself. Adaptability and evolutions are the best ways for improvement. The changes are not limited to any one aspect of the business, but every aspect should undergo the same. Those who are walking out of the trends will get perished. Customers now know the role they hold in business. They are brought closer to the organizations with the help of the medium of the internet. Almost instantaneously, everyone gets the feedback, discussions, and improvement of a product. As information and interaction happen on a live basis, the customer’s reaction always makes the firms under pressure to keep their reliability high. A dissatisfied or negative opinion is enough to sphere headword of mouth propaganda harmful to the organization. So the social networking media can act as a double-edged sword for the organizations. With the effective use of this, a firm can build a qualitative relationship with the customer. An organizations individual reach out to its customers is ensured up to an extent. It is not just about customer satisfaction alone. Studies show that 60-80% of customers who apparently claim to be satisfied show a tendency to look for new companies instead of the company in which they were already satisfied. Sounds a little paradoxical, but the reason behind this is that more than the satisfaction, a customer gets each time he or she does a transaction with a firm; it is the connection that matters a lot in long term relationships. Customer satisfaction is of little use unless the links for long term connection is inbuilt in a transaction. For example, if a customer can’t recall the name of the restaurant where he had a delicious dinner a few years ago or the website link of the movers and packers firm which he had hired long back, they are literally pushed away from the customer base, despite customer satisfaction. Primarily CRM improves the level of communication with the customers and their satisfaction. This establishes a continuous feedback mechanism from the customers who wish to maintain a relationship with a particular firm. By this way, this provides an easy way of data collection about the customers and also to rapidly expand the same in a continuous manner. This old saying is ever relevant in marketing. “Make new friends, but keep the old. One is silver, the other gold”. As already mentioned in the beginning, it is much less expensive to retain existing customers compared to getting new customers. The firms can save money by keeping a good relationship with the already existing customers rather than attracting new customers. Companies are able to deliver exceptional service by becoming customer-centric. They can feel the lows and highs of their customer opinion and it focuses on the needy areas. The firms are able to address the concerns, compliments, and complaints immediately. Improves profitability– Brand values play key roles in the survival of the business. In many cases, more than the primary necessity of a product, it is the brand values and the self-esteem that it gives makes a customer choose a product. Equally important is the confidence one gets from a brand value. Here comes the importance of open reviews that previous customers give about the product or service. Many times the buyer tends to go for a more expensive product if it has got high ratings and positive reviews. Innovation– Market trends are extremely unpredictable. Customer needs, desires and wish are highly dynamic. It is not an easy task to predict which solution will rule the market tomorrow. Therefore companies are always up against the daunting challenge of innovating new solutions. Knowing what a customer wishes, beyond what he opts today is the trigger for innovation. CRM provides platforms for the customers to come forward to give new ideas, their wish list, etc. by means of discussions, voting, etc. Word of mouth publicity: Satisfied consumers always will share their experience with others. For suggestions and recommendations, people are turning each other. All these happen only when the buyers consistently have a good experience from the brand. Generally speaking, there are three levels of relationship marketing. In the first level, a customer gets attracted to a firm by way of the wooing incentives offered to the customer and the warm relationship is established between them. Often companies provide the customer with a lot of information about the products, services, special offers, etc. in the form of catalogs similar approaches. This develops a sense of familiarity in the minds of the customers and they are encouraged to approach the same firm in the future also. In the next level, the particular firm tries to personalize their relationship by providing some special benefit cards or coupons for some items which likely to attract the customer. This is a key move to create a feeling among the customers that their status is elevated from an ordinary customer to a special customer. In the third level, the firm tries to make a structural connection with the customer. Typically in this phase, the latest communication technologies are tapped by leading firms today. For example, many firms introduce their apps to the customers with smartphones, so that within a single click they can go through a virtual shopping. These apps are made so user-friendly and provide the users with an enjoyable experience that they are tempted to explore these. Also, these apps enable the customers to give feedback, which helps the companies bring in necessary improvements. Basic Marketing– Where business achieves first sales. Proactive Marketing- The firm and customers work in collaboration to improve the services and products. Partnership Marketing– The firm provides modified products and services to their large customers, developing long-lasting partnerships in the process. In relationship marketing, modern technologies play vital roles. Interactions on consumers and firms tremendously rely on technology including, text messaging, e-mail and websites. Technologies bring transitions and innovations in an inter-organizational relationship. Key to effective use of technology in CRM is the integration of customer-related data. A consumer who appreciates the promotions, purchase guides, quotes automatically forms an emotional attachment to the firm. There lies the importance of technology, when the emotional part is valued more than the economical part. Technology discerns consumer commitment from organizational commitment. With the development of the internet, it is easier for the companies to track, store, analyze and utilize the data about the customers. Customers are provided with special deals, personalized ads, and expedited services as a token of love for their loyalty. Social media sites allow companies to engage their customers in an informal way. The world of business is opened before them in a single touch. E-Marketing channels’ roles are inevitable in maintaining customer relationship management. Call centers are helping agents to customers with fast and prompt responses. With the advancement in technologies, a client from anywhere can contact the call centers at any time. They bear an unexplainable part in proper customer relationship. A potential customer, before proceeding with the orders will have any queries. Instant messengers and chat rooms always help them with quick responses. CRM tools keep a track of client contacts not just in a static manner, but dynamically by utilizing even social media pages and other internet platforms. Sales teams get up to date and reliable information about the clients and up to date picture of the business scenario. It helps various departments work in a coherent manner and by avoiding duplication or unproductive redundancy. It is quite possible that amidst the busy schedule of day to day business management activities, people tend to forget calling a potential client or sending a follow-up email. Such things can have serious impacts on business. With a CRM system, such concerns are addressed very effectively as it can remind you of such meetings or calls with clients and prospects. Prior to the industrial revolution, customers had kept an intimate bond with their customers. The most powerful entity in the business field today is the customer. The technological advancements enhanced this growth a lot. CRM applications attempt to focus on individual customers to make the relationship long-lasting. Most organizations succeeded to create their lifelong customers with their data mining techniques and customer-centric approach. The emphasis is shifting now from the product portfolios to the customer portfolios. Firms that adopt the e-business and CRM applications will have the greatest fortunes. Although CRM is mostly viewed as technology-oriented management, the correct proportion of people, process, and technology only will reap the best results.